Taking the climbing photography clinic last month at the Red Rock Rendezvous (and my unsuccessful attempt to win the Rock and Ice photo camp contest) has reignited my passion and interest in photography–along with the spectacular scenery I’ve been seeing. I’ve been doing more reading and research, picked up more photography accessories, and purchased Adobe Lightroom (another ouch cost). So in a page ripped directly from fellow outdoor blogger Wilderness Dave and his excellent Photograph of the Week series (definitely check those out), I thought I might start a new semi-regular series of blog posts about the exploration of outdoor photography. I intend to discuss process and the behind the scenes elements which will serve first and foremost as a means to document what I have learned from both a composition, color, and light perspective, as well as an exploration of learning Adobe Lightroom–it’s a totally new and unfamiliar program to me. But first, a little background: I’ve always had an interest in photography to some degree or another. I remember back in, maybe, early college when I dug out my Mom’s old Minolta X-700 35mm SLR camera. She had the full deal, numerous lenses, cable shutter release, motor drive, tons of accessories. It was fun running around taking shots, messing with shutter speeds, aperture, etc. But as I was figuring things out it was always frustrating to have so few shots to play with on a roll of film, having to wait to get the film developed, only to get back a bunch of blurry or over or underexposed shots. I ended up taking one of those extra-curricular, not for credit classes that take place on college campuses where we learned all about the elements of photography, composition, and even had the opportunity to go develop some of our shots in the dark room and do some old-school post processing work. It was a lot of fun but my interest ultimately fell away due to the time and costs associated with shooting in film. The ease, convenience, and accessibility of digital cameras and the ever increasing role of the internet also certainly played a role in my demising interest in film. In enters a series of different digital point and shoot cameras over the years. I’d always look for increasing functionality and camera control with each upgrade, but never anything too major: price and portability always trumped performance for me. I would be visiting so many amazing places and I wanted better tools to capture and share those scenes. After much research and deliberation I ended up shelling out big money (for an unemployed dirtbag) to pick up the Sony NEX-6 camera. It’s a fairly high-end mirrorless, interchangeable lens camera that provided the best compromise, in my opinion, between the world of point and shoot and the full blown DSLR cameras. In other words, an imminently more portable camera that offers much of the features and performance of it’s bigger, heavier, and more powerful brothers and sisters. So there you have it! Another thing on my blogging plate–above and beyond my already significant backlog of posts. We’ll see how it goes. I made a somewhat impromptu visit to Zion National Park since I had to exchange an item at the REI Las Vegas store and it had to be mailed to them. With time to kill I made the two and a half hour drive to this iconic park. 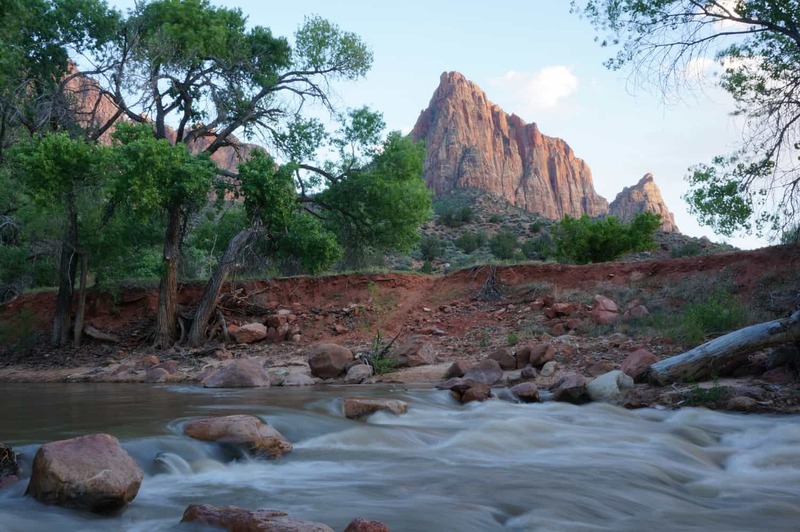 Zion is obviously a wonderland for tons of different outdoor activities, including photography. Every evening the bridge over the Virgin River is packed with people shooting the millionth photo of the Virgin River below, winding toward the Watchman at sunset. 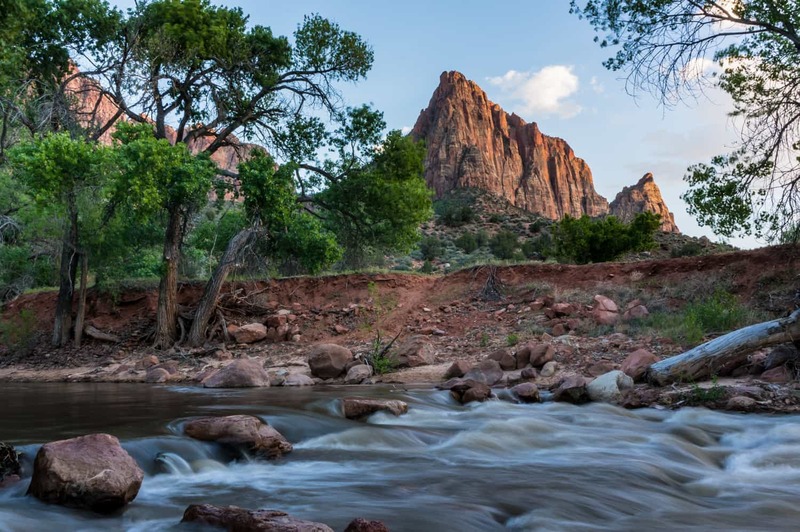 It is a gorgeous shot, no doubt, but I wanted to see if I could shoot something slightly different, so I headed down to the Pa’rus trail and to find access to the banks of the Virgin River. On a sandy embankment I found a clearing in the trees that offered a pretty good view of the Watchman. I set up my tripod and started snapping away as the sun started to set. This was my first ever time shooting in the RAW format. RAW is essentially a digital negative that by itself is not a usable image, but it captures all the data required to turn into something afterward. Therefore it requires post-processing like they used to do in a dark room to bring out the image. ISO 100 – decreased light sensitivity and thus more movement in the water, as well as producing the least amount of noise. f/22 – using the narrowest aperture would provide the greatest degree of focus and sharpness from the close river rocks, to the distant peak of the Watchman. 1/2 second exposure – using a longer exposure would give me that blurring and movement in the water that I wanted. Giving it that fuzzy water look. By no means am I an expert on good composition, but I know general thoughts like the rule of thirds or shooting with diagonal leading lines and that photos are generally ‘read’ from left-to-right. In this case I thought the large river rocks leading diagonally up toward the dirt path in the embankment which then leads you to the prominent rock formation was an eye pleasing composition. Furthermore, I was happy with how the trees framed my subject, the Watchman, and with the sense of movement conveyed by the flowing river in the foreground. As far as the rule of thirds is concerned, I think it was an okay composition: the river in the lower thirds, the sky in the upper thirds. The Watchman is mostly intersected by two of the thirds lines. Perhaps it could have been improved by placing the Watchman further off of center? So, again, this was my first day ever shooting in RAW and I’m still learning Lightroom, but here’s the before shot (the JPEG my camera shot along with the RAW). The original, unprocessed JPEG shot. The image comes out somewhat flat. The sky is overexposed, losing the couple white fluffy clouds and the blueness of the sky (a polarizing filter might have been a good call for in-camera correction). It also lacks the sun’s glow on the Watchman and the light appears a little flat along the darker river bank. First thing I did in Lightroom was to apply a gradient filter across the sky and the rock. Within that, I upped the clarity to bring the rock back into the picture. I dropped the shadows down a little and bumped the contrast up so the rock would be a little more dramatic. I dropped the exposure down 3/4ers of a step so the sky would be blue again, the clouds would be more apparent, and the rock would be similar in exposure to the rest of the image. Finally I bumped up the saturation just a little to warm the light up on the rock. Secondly, image-wide, I increased the clarity and vibrance to really bring out the detail and color overall. I dialed the blacks back slightly and increased the shadows to bring some of the details out in the dark areas. I also dialed the whites back ever so slightly. I also increased the sharpening overall, so the image would feel crisper. With sharpening comes increased noise however, so to counteract that, I upped the luminance levels. Clarity and Vibrance are two new controls to me and what they do is somewhat of a mystery for me. But the idea behind them is that Clarity increases local midtone contrast and edge definition (see this better description) while Vibrance is supposed to saturate the colors that “need” saturating while not oversaturating others (also see here for a better description). Either way, they really make landscape shots seem to come to life. Finally, I wanted to increase the drama and bring some details back into the river so I added another gradient filter to the bottom third of the image. I punched up the clarity a little once again, increased the contrast, dropped the shadows to darken it, while increasing the highlights to make the whites in the rapids pop a little. I then dropped the exposure down a full step. I’m quite happy with how this image came out in the end. It’s a gorgeous landscape (all throughout Zion), so I didn’t have to do much but push a button to capture it. It was just a matter of trying to best convey that natural beauty in a simple digital format. Any feedback on the composition, light, or post processing tactics used? Well done, man. All in all, a great image and nice composition. How do you like that Sony Nex6? I thought about getting one myself but I stuck with the DSLR for now. Thanks Dave! I’ve been very happy with the NEX-6 thus far. I like that it’s a little smaller and lighter than a DSLR, and thus I’m more inclined to bring it along in the backcountry, and it takes up less space in my already tight living conditions (truck). But yeah, I’m not coming from a DSLR perspective either, so who knows. At the Red Rock Rendezvous photography clinic though, I was happy that our pro instructor John Evans with Petzl also uses the NEX-6 for his backcountry endeavors–but professionally he still uses a DSLR of course.